Thanks for making my first listening tour a success! The intent of my first 12th District “listening tour” this past month was to hear directly from the people I serve, where they are. It worked, the schedules were packed, and I could not be more appreciative of how the tour went. Day one started in Leavenworth, with stops in Wenatchee and East Wenatchee (and back to Pybus Public Market in Wenatchee) before concluding that evening in Quincy. Day two began in Chelan, followed by stops in Pateros and at Alta Lake State Park on the way to Winthrop. The 12th District is one of the largest – and definitely most beautiful – in our state. We managed to travel to all four counties on the tour: Chelan, Douglas, Grant, and Okanogan. 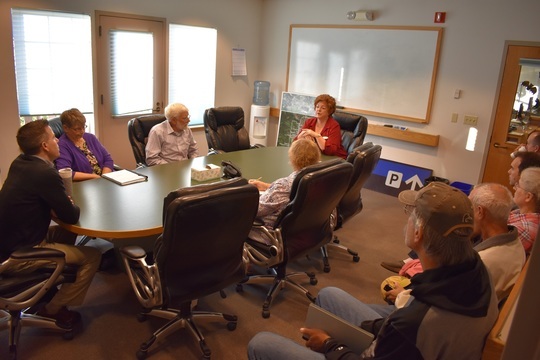 One of my listening tour sessions at City Hall in Leavenworth with Mayor Farivar, councilmembers, and residents. I am grateful to all the people and organizations who participated. The things I heard ranged from updates on ongoing issues to brand new topics. My staff and I came away with pages and pages of notes that will be very useful, and although I did not go looking for ideas to turn into Senate bills, it’s very possible that some legislation may result from things I learned about on the tour. Also, thanks to everyone who appreciated my idea of a Saturday morning community hike up Saddle Rock. It was fun way to connect with you all in a different way and enjoy one of our area’s many awesome outdoor recreation sites together – especially because the weather was just about perfect for early October. 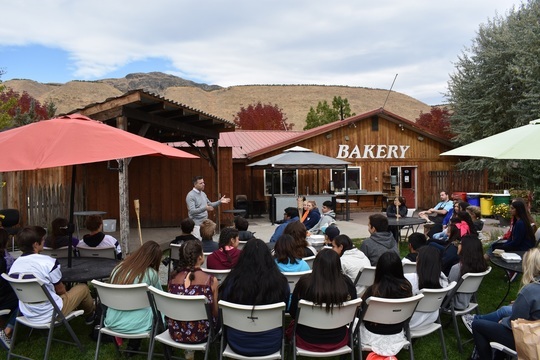 The Sweet River Bakery in Pateros was a great place to stop on the tour's second day. I enjoyed discussing issues with Pateros School District students. The success of this first tour already has me thinking about planning next year’s tour. We’ll likely spend plenty of time again in Wenatchee and East Wenatchee but add in visits to different areas, including possibly Cashmere, Waterville, Mansfield, Bridgeport, Soap Lake, Grand Coulee, Nespelem, and Twisp. I’m already looking forward to it! Thank you again for the opportunity to serve as your 12th District state senator. What a privilege it is for me to represent you. Please contact my office if you have any questions.